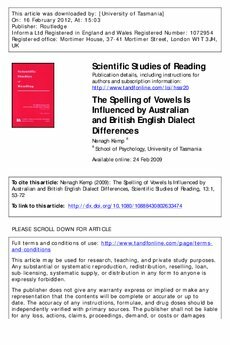 Two experiments examined the influence of dialect on the spelling of vowel sounds. British and Australian children (6 to 8 years) and university students wrote words whose unstressed vowel sound is spelled i or e and pronounced /I/ or //. Participants often (mis)spelled these vowel sounds as they pronounced them. When vowels were pronounced similarly in both dialects (e.g., comic, with /I/; fossil, with //), British and Australian writers wrote the correct spelling similarly often. For vowels pronounced as /I/ in British English but // in Australian English and spelled with i (e.g., muffin), British writers correctly wrote i significantly more than Australian writers. For vowels with this same pronunciation pattern but spelled instead with e(e.g., rocket), Australian writers correctly wrote e significantly more often than British writers. Dialect-related phonological differences influenced the spelling of both beginning and skilled spellers across both familiar and unfamiliar words.